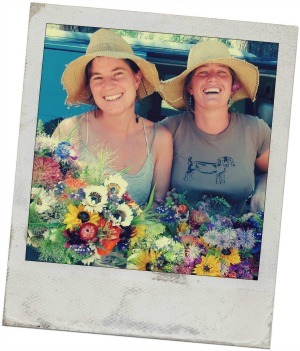 Soil Sisters Farm is a diversified farm in the Sierra Nevada Foothills of California, a stone’s throw from the South Fork of the Yuba River. We are a women-owned business, founded in 2010 with a commitment to valuing healthy relationships – to oneself, one another, and the land – as a way to bring health and beauty into our community. We raise flowers, vegetables, and a pretty happy population of bees on a one and half acre parcel of leased land just outside of Nevada City. To create an entity that can give us the strength, validation, and support we need. To pursue farming by our own standards of success and health. To value women’s voices and women’s wisdom. To celebrate the slowness of seasons, the patience of god, the beauty under our feet, between our hands, and in the river. To lift up song, dance, prayer, reflection, celebration, communication, growth. To let ourselves be overwhelmed with delight and joy, and overwhelmed with heartache and loss, and to hold space for both. To hold each other up, to hold each other accountable, and to honestly and gently express our needs. To daily affirm one another, and to appreciate the presence, heart, and skill each woman brings. To recognize our different paths and goals, and to revel in our ability to weave them together. To lead with confidence and flair. To do what feels right. To change our internalized doubts and pains into healing and positive action. To inspire and empower other women in all facets of their lives. To include men to participate and share in our vision. To take the time to enjoy the fruits of our labors – cooking slow dinners, eating carrots in the field, and drawing, painting, and photographing what inspires us. To dig, cultivate, seed, transplant, sweat and move with intention and self-awareness. To value and love ourselves deeply. To practice self-care. To practice kindness and compassion. To commit to living fully and joyfully.